Sushi Avenue is on a major growth spurt. Along with providing sushi to an ever-increasing number of supermarkets, corporate campuses and other outlets (up to more than 300 in 21 states), the 11-year-old, Eagan-based company is also in the restaurant business. A fast-growing restaurant business. Earlier this month, its two-year old One Two Three Sushi mini-chain debuted its fifth location (on the skyway level of UBS Plaza in downtown Minneapolis), and now its four-year-old Masu Sushi & Robata division just announced that it is developing a third location, in Apple Valley. 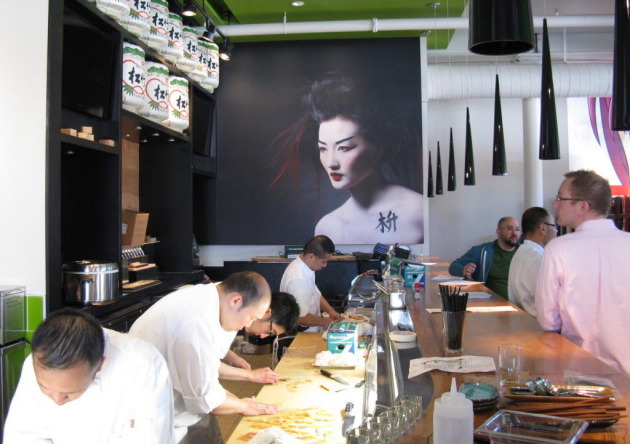 The south suburban newcomer will be similar to its northeast Minneapolis and Mall of America predecessors, with two distinctions: A smaller footprint (in the 80-or-so seat range), and a slightly different name: Masu Sushi & Noodle. The menu -- the work of La Belle Vie chef Tim McKee, wearing his consultant's hat -- will mirror its counterparts, with an emphasis on small plates, sushi, robata and, as the name suggests, a number of noodle dishes. The new space, formerly the home of El Loro Mexican Restaurant, is being repurposed by Shea, the Minneapolis design firm responsible for the distinct look at Masu's two other locations (the restaurant's northeast Minneapolis outlet is pictured, above, in a Star Tribune file photo). Look for a late summer or early fall opening.